The best ceramic loaf pans on the market are made of heavy-duty material, will bake your dishes evenly, and are non-stick. If you are a meatloaf junkie or like to bake bread in the oven, having a quality loaf pan is a must. Bread pans are generally 9 x 5 x 2.5 inches, but the exact measurements vary from brand to brand. Since you will be baking cakes, breads and other thick items, it is important to choose a loaf pan that cooks slowly and evenly without burning. Loaf pans are made from different materials. The most common materials used to make the pans are glass, aluminized steel, ceramics and stainless steel. When it comes to pans and other bakeware, how important is the material? Should you be baking your dish in a ceramic loaf pan or a metal pan? The type of food you wish to cook will determine whether to go for a ceramic or metal loaf pan. Shiny or light-colored metal bakeware is ideal for even browning. On the other hand, darker-colored metals are great for getting your bread the deep-brown crusts but they can cause over-browning. Aluminum bakes food evenly and conducts heat better than stainless steel. However, be careful when storing foods in aluminum pans; the aluminum can react with the acids in the food. As a result, the dish may end up having a metallic flavor. Since metal heats up and cools down faster, it is ideal for items that take a short time to bake at high temperatures, for example, HH Oven Fries and HH Whole –Wheat Drop Biscuits. The best dishes to bake in metal pans include: tarts, muffins, cookies, cakes and breads. Copper bakeware do not react well to high heat but can be used for most jobs. Copper baking pans are good conductors of heat. This explains why the bakeware are usually more expensive than stainless steel and aluminum baking pans. Copper heats and reacts to temperature changes quickly, allowing the food to cook evenly while giving you better control. Copper is a reactive metal. Therefore, it has to be lined with another material, such as tin or stainless steel. You may also find a number of non-lined copper cookware on the market. However, these appliances are specifically meant for sugary cookery, where reactiveness is not such a big deal. Copper is not ideal for high-heat cooking, but this does not take away its impressive performance. The metal is great at distributing and retaining heat. When baking with copper pans, there is no need to use a high flame. See the best copper baking pans. Wash your copper baking pans with soap and water, and use a plastic brush to gently scrub any stains. Do not use abrasive cleaners or steel wool on copper as they would scratch and damage it. After using your copper baking appliances for some time, the outside lining will age, or patina. If you wish, you can keep this aged look or polish it away with a copper bakeware cleaner or various home remedies. Pros: Copper heats very quickly and, therefore, does not require much pre-heating. The metal is a great heat conductor; it adjusts to temperate changes quickly and heats food evenly. Cons: Copper bakeware are very expensive and do not work on induction cooktops. Moreover, they require regular polishing to maintain their shine. If you are looking for a less expensive alternative to stainless steel bakeware, anodized aluminum loaf pans should be on your choice. Depending on the types of dishes you usually prepare and the appliances you already have in your kitchen, you may want to purchase a set of aluminum bakeware. Aluminum is usually mixed with stainless steel to improve the heat conduction characteristics of the latter. Raw aluminum is a reactive and soft material. Therefore, it must be processed in a number of ways before it is used as bakeware. The majority of aluminum out there is known as anodized aluminum. This metal has been modified through various chemical processes to make it non-reactive as well as harden it. Aluminum bakeware are usually, almost always, paired with a different metal to make them more durable. Aluminized steel sheets and baking pans are popular with bakers because of their corrosion-resistance property, great heat transfer and durability. To clean anodized aluminum, use soap and water and rub tough spots with a plastic scrub brush. Do not use steel wool or harsh cleaners on the appliances. Generally, anodized aluminum is dishwasher safer. However, check with the manufacturer just to be sure. Pros: Anodized aluminum is lightweight, affordable, scratch-resistant and durable. The metal is an excellent conductor of heat (outperforms stainless steel), which makes the appliances suitable for cooking foods on the stovetop and getting evenly baked items in the oven. Cons: If you are cooking using an induction burner, regular anodized aluminum will not work. If you would like to cook on the induction stoves, check whether your aluminum cookware has been specifically fitted to work on it. Apart from the above, anodized aluminum bakeware may not be the best for sweet baked goods. This is because dark-colored metals usually lead to over-browning if you don’t keep watch of your dishes closely. Stainless steel loaf pans are non-reactive, rust-resistant, durable, and dishwasher-safe. The material is dent- and scratch-resistant, and is pretty easy on the eyes. However, on its own stainless steel bakeware is a poor heat conductor. To find a good stainless steel pan, choose a model that has a core of another type of metal that is a good conductor of heat, for example, copper or aluminum. Aluminum bakeware are more affordable than their copper counterparts. However, copper conducts heat better than aluminum, and this explains why the loaf pans are sold at different prices. Copper baking pans react faster to temperature changes, and this gives you more control over the cooking process. While you will find stainless steel baking pans, their heat conductor capability would be poor if they have not been mixed with another type of metal that conducts heat more efficiently. Generally, you will get better performance in terms of heat conduction from aluminum bakeware than stainless steel options. Cleaning a stainless steel baking pan is easy; simply scrub the appliance with soap and water. If the pan has burnt-on debris or stains, fill it with water and boil for 20 minutes. The debris will loosen up. Use a wooden spoon to scrape-up stuck-on spots, pour the water, and wash as normal. For bakeware with even tougher stains, coat their bottom with a stainless steel cleaner (such as Bar Keeper’s Friend) or baking soda and scrub. Pros: Stainless steel is dishwasher-safe, durable, non-reactive and less expensive than other options, such as copper. Cons: Stainless steel is a poor conductor of heat when used alone in bakeware. The metal has to be mixed with aluminum or copper to improve its heat conduction. Moreover, stainless steel baking pans can be expensive, especially when mixed with copper core. Ceramic pans conduct heat well but can cause over-browning in sweet dishes. Dishes baked in ceramic pans look pretty! You can serve or store the foods in their baking dishes. Ceramic baking dishes come in different sizes and shapes. Ceramic is ideal for dishes that need slow cooking as it heats up gradually. Examples of such dishes include lasagna and custards. Unlike aluminum, ceramic is non-reactive. Therefore, you can use it to bake and store both alkaline and acidic foods. 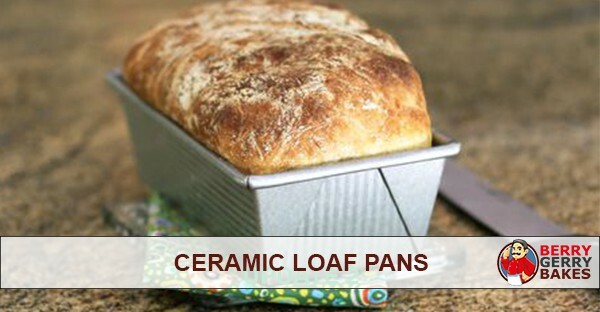 Ceramic loaf pans and other appliances are visually appealing and, therefore, can be used for oven-to-table serving. If your ceramic dishes are very dirty, wait for the dish to cool. After this, soak the appliance with water and soap until the residue dislodges from the pan. From there, use a sponge or plastic brush to scrub off stuck-on stains. Majority of ceramic loaf pans are dishwasher safe. Pros: Ceramic has a smooth glaze and is almost non-stick. This material heats slowly to prevent over-browning and is non-reactive, which makes it suitable for both alkaline and acidic foods. Ceramic dishes look pretty and food can be served in the baking dish on the table. Cons: Ceramic bakeware chips easily and can break more easily than other appliances. Apart from this, the loaf pan can over-brown sweet items. Which is the Best Ceramic Bread Pan to Buy? When looking to buy a bread pan, there are a number of things you should keep in mind. In particular, you want a pan that is non-stick. After your cake, meatloaf or bread has cooked, you do not want to be left with the task of scrubbing it off the surface of the pan. Materials used to make the pan. 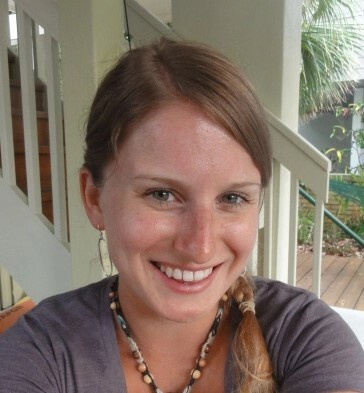 Are the materials lead-free and Pfos-free? Oven temperature. What is the maximum amount of temperature that the pan can withstand? Does the company offer a warranty for its products? You may want a loaf pan of a particular color that will complement your kitchen décor. Below is an overview of the top-rated ceramic loaf pans available on the market. 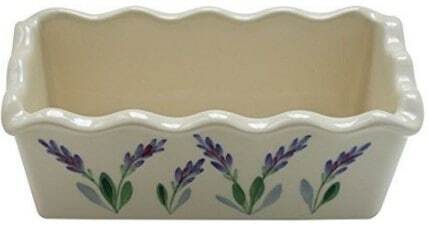 Celebrate It® Ceramic Mini Loaf Pan is the most popular decorative ceramic loaf pan on the market. The loaf pan can be used to bake breads, cakes, meatloaves, and more idents for a lavish dinners party. You can also use the pan to serve yummy desserts and savories. The size of the pan is perfect for making bread as gifts. Moreover, the appliance cleans up easily. TIP: During the holidays, leave bread in the pan as an extra gift for the receiver to use to make their own bread. You can also fill the pan with things such as soaps, crackers, cheese, chocolate covered berries, cookies, etc. 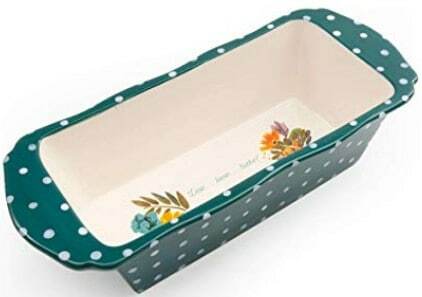 The Pioneer Woman ceramic loaf pan is beautiful and measures 13.4 x 4.4 x 7.1 inches. The pan is of the right size, washes up nicely and its depth is good. On the outside, the pan features a vintage design that will add pop and character to any kitchen. The Pioneer Woman loaf pan is dishwasher-safe and can take temperatures of up to 350 degrees in the oven. This ceramic baking pan is ideal for veggies, meatloaf, breads and more dishes. The GreenLife ceramic non-stick pan is a beautiful pan that allows anything you bake in it to slide out right thanks to the premium ceramic non-stick coating. This is a great pan for baking shallow muffins. Its cups are slightly wider than normal, and are just ¾ inches deep, with each holding approximately ¼ cup. However, the ceramic coating is thin and after owning the pan for about a year or two, it may start to chip away. 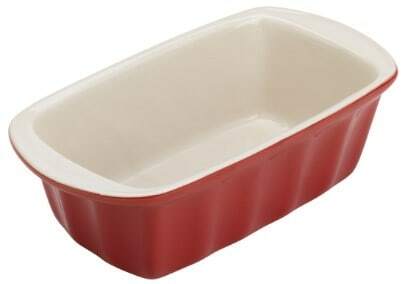 The Good Cook ceramic loaf pan is red on the exterior and cream on the interior. 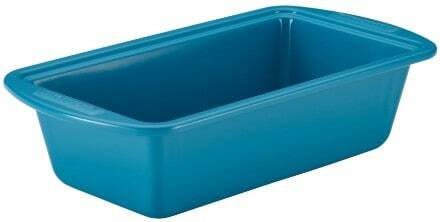 This loaf pan measures 13.1 x 8.8 x 7.7 inches and bakes bread evenly. Moreover, you won’t have to worry about your bread sticking at the bottom. 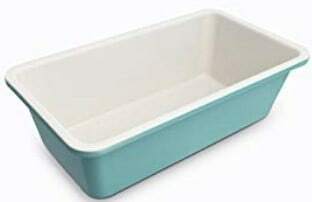 The Good Cook ceramic loaf pan can be out insider an oven, freezer or microwave. The pan is also dishwasher-safe. The only issue you will experience is getting the label off the inside of the pan. The glue is quite tough. 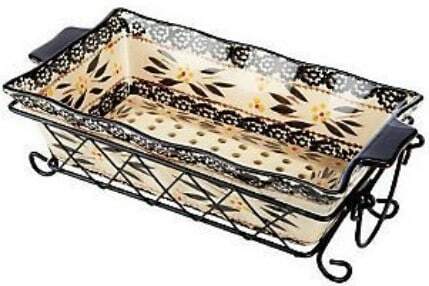 The Temp-Tations Floral Lace Loaf Pan features a 1.7-qt ceramic loaf pan and drip tray. This baking appliance can withstand temperatures of up to 500F in the oven. You can also use the baking pan in a microwave or store it in the freezer or refrigerator. The appliance is also dishwasher-safe. The drip tray will prevent your meatloaf from marinating in fat. When baking bread, the tray doubles as a trivet. The Emile Henry loaf pan is made of high-fired Burgundy clay using high resistance ceramic. The high-resistance burgundy clay has superior heat retention and even heat-diffusion properties, which keeps food hot for long on the table. The Emile Henry Ceramic loaf pan can take oven temperatures of up to 530 degrees F. The appliance is microwave-safe, broiler-safe and oven-safe. You can also store it in a refrigerator or freezer. This easy-to-clean loaf pan is durable and scratch-resistance. Its outer glaze is hard and does not scratch or craze. The glaze is perfect for use in the kitchen to make delicious desserts and meals. The Fiesta loaf pan is made in the USA and features a vitrified ceramic body and lead-free glaze. 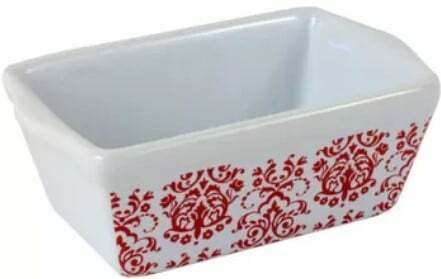 This loaf pan has a simple design and comes in different colors, including red, cobalt, ivory, paprika, among others. The Fiesta loaf pan is heavy and looks nice sitting on the table. You can use it to make pound cakes, bread and meatloaf, which won’t stick to it when they are ready. The loaf pan is dishwasher-safe, oven-safe and microwave-safe, and is sold with a 5-year warranty. This pan can withstand oven temperatures of up to 500 degrees. 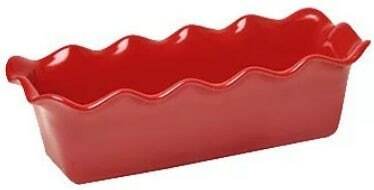 The Silverstone ceramic loaf pan comes in a bright, cheerful red color that will make your baking fun. This loaf pan is made of PTFE- and Pfoa-free hybrid ceramic material that does not chip and is non-stick. The edge of the bread pan is rolled in to prevent warping when the appliance is placed in the oven. The Silverstone ceramic loaf pan can take oven temperatures of up to 500 Degrees F.
The Arousing Appetite loaf pan is a beautiful piece that would be a great addition in any kitchen. The pan features a pretty design that is a combination of hand-painted green and violet floral patterns. You can offer the pan as a gift for a best friend’s birthday, Mother’s Day, couple’s housewarming, anniversary, bridal shower, or wedding. The Arousing Appetitive pan has sloping slides and holds enough for a 1 lb. loaf. You can also use it to tastefully resent bagels, crisps, chips, mini finger food sandwiches, crostini, chex mix, guacamole, dips, puddings and other party snacks to guests. The bread pan is safe for use in the microwave, oven and dishwasher. You can use the pan to reheat leftover sandwich loaf, angel food cake, focaccia or lemon bread in the same dish you baked it. Made in the USA with 100% lead-free materials, the Arousing Appetite bread pan is an eco-friendly pan that will last you for years. The Casa Ware loaf pan features coated silver colored granite ceramic that makes it easy to release your bread, cakes, and meatloaf from the surface. After baking, simply wipe or scrub the bottom gently to remove any food. The pan has rich cream and brown accent flecks that make it look fashionable. The pan can tolerate up to 536 degrees F of oven temperature. Moreover, it does not blister or peel at high temperatures. 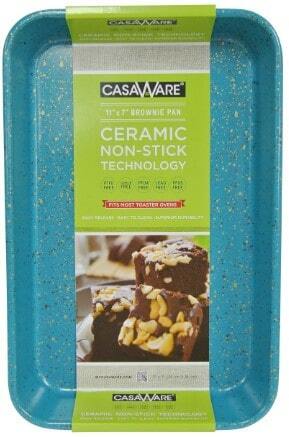 The Casaware loaf pan has two layers of non-stick ceramic coating, which make it easy to clean and durable. The baking surface is PTFE-free, Pfos-free, Poi-free, lead-free and cadmium-free. To clean the pan, wash in warm soapy water and dry well with a soft cloth. Handwash the pan with a sponge or soft cloth and liquid dishwashing soap or non-abrasive cleansers in warm water. Finally, rinse and dry the pan with a soft towel. The above are the best ceramic loaf pans on the market. These pans are sturdy and cook food well without getting them stuck. With these pans, you do not need to oil or grease them when cooking your favorite bread, meatloaf, cake or other dishes. The dishes pop right up there and then and there is hardly any clean-up needed.